Londonist likes pastries. Especially inexpensive, tasty international ones. 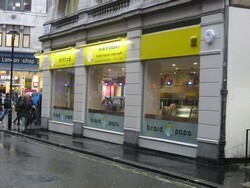 Towards the very end of 2006, Japanese cream puff meisters Beard Papa's came to town and set up shop on Oxford Street. The profiterole-like creations have already taken Japan and parts of the U.S. by storm; (Gothamist covered them a while back). 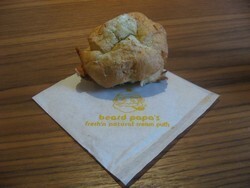 London marks the first European outpost of what's shaping up to be puffy pastry dynasty. We were the only non-Japanese customer in the store, which made us feel like we were in on a very good secret. £7.40 got us a box of six with both traditional and green tea filling. Our server sweetly sent us on our way, suggesting we eat all our Beard Papas before tomorrow. Somehow, Londonist doesn't imagine this will be a problem.